Welcome home! It is great to be back together as a congregational family. Each year we build upon the memories of those before. Some of us were given Jewish memories as children. Others of us have created Jewish memories as adults. Not every Jew is religious. Some 42% of Israelis claim they are secular. That was the case with one Israeli university professor of English Literature who was not just secular he was anti-Religious. He went so far as to write an op-ed saying that the worst thing one can do to a child is give them a religious education. It will “poison the mind,” he claimed. Yet a near death experience during Israel’s First Lebanon War changed him. As Rabbi Nissan Antine of Potomac, Maryland, tells the story, following the war, the professor made an appointment with one of Israel’s prominent rabbis to see how he could commit his future to Jewish education. I am a committed Zionist. I know Herzl’s manifesto “The Jewish State” by heart. I started reviewing it in my mind but that did not work either. Memory is fundamental to who we are as individuals. It is the faculty that holds our knowledge and our wisdom. It guides our relationships and moves our personalities. Memory is essential to who we are as a people. It binds us to others. It helps us to know to whom we belong. And in Judaism, memory is not passive, it is active. Our memory of the past guides our future. First and foremost, memory makes us who we are as individuals. We remember our childhood, our teachers, our laughter, our loves, our losses, our mistakes, our moments of success, our mitzvot- our actions that made a difference. In this technological era, we are well aware how critical memory is in our lives – personally and professionally. We rely on our cell phones to tell us our relatives’ phone numbers and our daily obligations. How many megabytes and gigabytes do our computers have? How do we save our digital photos? How do I save my twenty years of sermons as a rabbi? Flash drives, hard drives, cloud storage? The story is told of two elderly ladies who were enjoying the sunshine on a park bench in Miami. They had been meeting in that park every sunny day for over 12 years, chatting and enjoying each other’s friendship. One day, the younger of the two ladies, turns to the other and says, "Please don’t be angry with me dear, but I am embarrassed. After all these years, what is your name? I am trying to remember, but I just can’t." The older friend stares at her, looking distressed, and says nothing for two full minutes. Finally with tearful eyes, she says, "How soon do you have to know?" When we lose our memory, we lose ourselves and our connections. Memory helps us to find our way home – both literally and figuratively. Today, Rosh Hashanah, is called Yom Hazikaron, a day of remembrance. Today we cherish our individual memories as we commit to crafting the lives that we want remember as we age and the lives for which we want to be remembered when we are gone. Today, Rosh Hashanah, is called Yom Hazikaron, a day of remembrance. On this day we remember not only who we are as individuals but who we are as a people. Rabbi Avraham Infeld tells the story of his first day at the Hebrew University in Jerusalem. He came from a long line of physicists and from the day he was born, his father fully expected his Avraham to be one of the greats – another Einstein. But on the first day of classes as he sat in the lab, Abraham looked out the window and saw a beautiful woman passing by and entering the history building. He followed her in, changed his course of study, and fell in love with this woman who would become the grandmother of their now 14 grandchildren. Judaism is learned by creating memories around Seder tables, around Shabbat tables, serving in soup kitchens, at Jewish summer camps. Judaism is learned through the songs we sing, through the stories we tell, and through the smell of matzah ball soup wafting through the air. Judaism is learned while climbing Masada and praying at the Western Wall. The American writer Isaac Bashevis Singer remarked that Jews suffer from many illnesses but amnesia is not one of them. The words Zachor “remember” appears 197 times in our Hebrew Bible. Remember! Our Torah tells us. 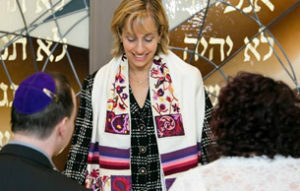 Transmit Judaism from one generation to the next by living Judaism. Do not forget! Jewish forgetting is not the dementia that some of us fear as we age. Jewish forgetting is the failure to transmit Judaism to the next generation. We forget when we fail to embrace the Judaism our parents, grandparents, or Jewish teachers taught us. We forget when we walk away from Torah and from Jewish celebrations and customs. We forget when we fail to teach them to the next generation. Today is Yom Hazikaron, it is a day of remembering. In Judaism, remembering is not passive, it is active. It is a commandment. Joshua Foer, in his bid to become the 2009 USA Memory Champion wrote: In Judaism, observance and remembering are interchangeable concepts, two words that are really one… For Jews, remembering is not merely a cognitive process, but one that is necessarily active. Other people remember by thinking. Jews remember by doing. Since I moved down South, Charleston has become a strong part of my memory. My first visit there was in 1998. My father was dedicating the Holocaust Memorial so all five kids went down to surprise my mother for her 65th birthday. My last trip to Charleston was two months ago. I passed that Holocaust Memorial that my father dedicated 17 years before and walked one block down the street to the Emanuel AME Zion Church. The memorial outside was still fresh with flowers, with photos, with tears, with loss, with the silence of sadness and profound pain for the nine vibrant lives tragically stolen from this world by Dylan Roof, a youth filled with rage and hate. The Holocaust Memorial on one block. Mother Emanuel AME Zion on the next. During hot weeks of this past summer, six African American churches here in the South were set aflame – at least three of them were confirmed to be by arson. One church just 7 ½ miles from here, Briar Creek Road Baptist Church, also fell victim. Their children’s building burned to the ground. Their children’s choir sang here on MLK three years ago. In 1938, my father left his birthplace of Munch immediately after the Munich synagogue was set aflame. Hitler saw it as a blight on the city’s landscape and with a simple wave his hand motioned his commanding officers to ensure its destruction. Synagogues burning in 1938. Churches burning today. Jewish memory is not something of the past. Jewish memory compels our future. Hatred whether that of Egypt or of Amalek our archenemy in the Torah, whether that of the Nazis during the Holocaust or that of white supremacists and religious extremists today needs to be eradicated. We who have been segregated in the ghettos for centuries should fight to integrate our neighborhoods and lives. We who have been culturally misunderstood should work to understand other’s cultures. We, who have been arrested for no cause should fight against the disproportionality of people of color being policed, incarcerated, and sentenced to death. We, who have been kept out of universities, should strive to achieve educational equity for all. Stephen Carter, a law professor at Yale tells the story of a painful move he experienced when he was child and his African-American family moved to a white neighborhood in Washington, D.C. But then one person, a religious Jew, turned his anxiety to ease. She arrived home from work, said “welcome” with a booming confident voice, went into her house, only to emerge minutes later with a huge tray of cream cheese and jelly sandwiches she carried to their porch and offered with a ready smile. Stephen Carter learned about race relations from one human being, a religious Jew. This year, I hope that others can learn about race relations from each one of us. This is the reason we are not just having an MLK Shabbat and sermon exchange but we are engaging in a yearlong exchange with another congregation, St. Paul Baptist Church. Their students and ours, their families and ours, their teens and ours, their Sisterhood and potentially their Brotherhood and ours, will connect at soup kitchens or playgrounds or picnics to hear each other’s stories, learn about each others lives and form relationships. May others learn about race relations from each one of us – through our smiles, through our outreached hands, through our words, our hearts, and our love. Today, Rosh Hashanah, is called Yom Hazikaron, a day of remembering. Today we commit to creating and restoring and maintaining memories that matter. Each time we tell stories about our loved ones who have died, we strengthen our memory of them. Each time we celebrate Shabbat and holidays with guests, we strengthen Jewish memory for all those around our table. Each time we journey together on the road to justice, we remember Egypt. Each time we read Torah, our history becomes our memory. It becomes us. Like the soldier in Lebanon, it is never too late to create new memories. It is never too late to create better memories. It is never too late to create Jewish memories. The blast of the shofar calls us to remember. We blow the shofar to remember creation. We blow the shofar to remember the binding of Isaac. We blow the shofar to remember our past and to be inspired to create a better future. We blow the shofar to remember God. In the Midrash, the shofar’s blast is a cry. It is our matriarch Sara’s cry in Hebron when she learned of Abraham taking Isaac, her only child, to offer as a sacrifice. It is my grandmother’s cry in Munich when she realized that if she did not leave immediately with her children all would be lost. It is Pastor Clementa Pinckney’s cry in Charleston, when the boy he welcomed into Bible study lifted up his gun to take life and spill blood in his Church. It is God’s cry in seeing the pain and plight of our world. The shofar’s blast is our cry today. Remember your personal past. It is who you are. Remember your people’s past. It is to whom you belong. Remember your call. It is who you are meant to be. Joshua Foer, Moonwalking with Einstein, as quoted in Kissileff, “Judaism,” 26.